Middle school teacher Yanagi-sensei is re-evaluating her lessons now that the testing averages are down. Taniguchi-sensei asks her out on a date, but she turns him down, citing all the work she has to do. She goes to a convenience store to buy something for dinner. while there, she thinks about Nasa, wondering why he didn’t go to high school. She runs into Nasa after leaving the store and notices he’s marries. When he confirms this, she imagines he’s turned into a delinquent and decides to make a teacher visit immediately. They are greeted by Tsukasa, who’s appearance isn’t what Yanagi-sensei imagined. She decides she can’t let her guard down regarding Tsukasa. Her tummy growls, so Tsukasa invites her for dinner. Yanagi-sensei is amazed at how good Tsukasa’s food is. She catches herself getting sucked in, deciding there has to be a problem with Nasa and Tsukasa being married at such a young age. But seeing them together, she realizes they really do love each other, and that is reflected in the cooking. Before leaving, Yanagi-sensei encourages Nasa to finish high school and attend college. He refuses, citing he wants to spend time with Tsukasa. If they have problems in the future, his future self will handle it. Yanagi-sensei walks home and re-evaluates her life. As such, she gives Taniguchi-sensei a call and accepts his date request. 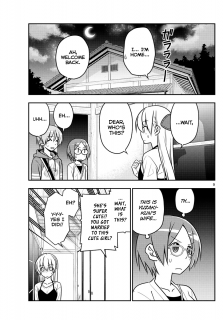 With Tonikaku Cawaii chapter 48, we get a story of someone outside evaluating Nasa and Tsukasa’s life together. We get more flags set. Oh, and life is short, so make the most of it! Teaching is a good profession. I know quite a few teachers. Therefore, I can understand Yanagi-sensei’s obsession with her teaching job. It makes even more sense in light of Japanese culture. There is a certain obsession they have about the future. Nasa is kind of an anomaly in this regard. He knows that if he attended college, he might get more money. But at the moment, he’s rather spend his time with Tsukasa. And if the future brings problems, he’ll cross that bridge at that time. Life is short, so make the most of it while you can! It was nice to see Yanagi-sensei go ahead and accept the date request from Taniguchi-sensei. In some ways, they reminded me of Katsura-sensei and Kaoru-sensei from Hayate the Combat Butler. Hata-sensei again has some warning flags set in Tonikaku Cawaii chapter 48. It is almost certain that Tsukasa is immortal. The chapter splash page showed her in an old school house in an old school uniform. If I had to guess, the image would be set in the mid-20th century. That aside, when Nasa mentions valuing the here and now, this was framed with shot of the moon. This obviously evokes the Kaguya-hime story again. Then Nasa mentions that if he encounters problems in the future, his future self will do something about it. This helps push the notion that as in the Kaguya-hime story, where she was returned to the moon, Tsukasa will be forced to leave Nasa. At that time, Nasa will be forced to do something to get her back, even if it means flying to the moon. But hopefully, that time is far down the road. I wouldn’t expect to see this come into the manga until the series is nearing an end. « Fate/Grand Order Rakes in $3 Billion Globally!